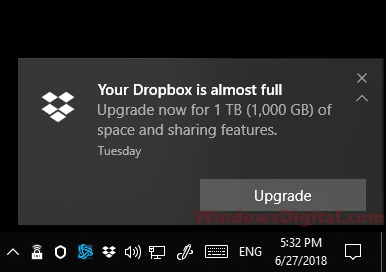 Getting annoyed by frequent “Your Dropbox is almost full, Upgrade now for 1 TB of space and sharing features” notification message in the action center? 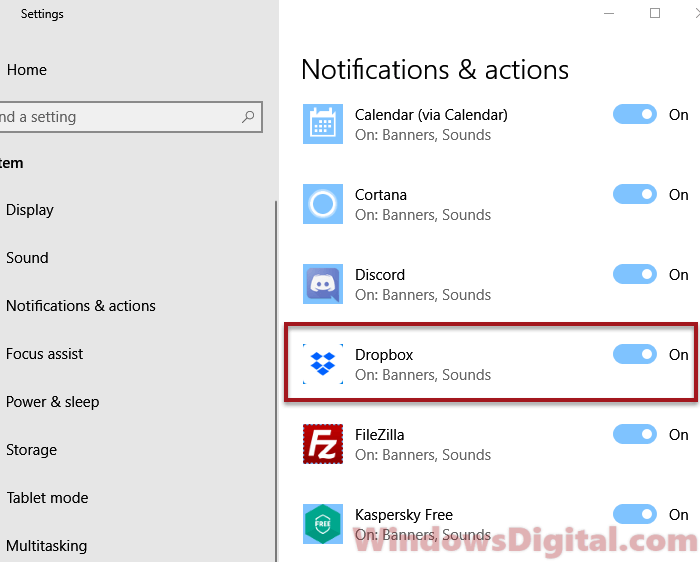 Here’s how to turn off or disable Your Dropbox is almost full notification message in Windows 10 to stop it from ever popping up in the taskbar area again. Dropbox is certainly one of the best cloud storage services for backup and syncing purposes. The service comes with only 2GB of free space. Any more space will require a membership subscription. For most of us who don’t willing or can’t afford to spend for extra spaces in our Dropbox accounts, when it’s running out of space, it will keep sending you the Your Dropbox is almost full message in the notification area and remain active in the action center in Windows 10. 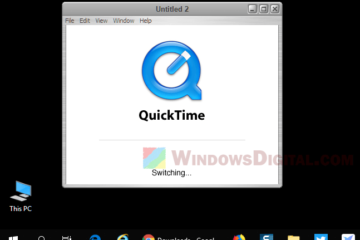 The notification will show up every few minutes or when there is a new file added, removed or sync via Dropbox. To turn off Your Dropbox is almost full notification message, here’s a few things you can do. There is no way to disable only one type of notification from any app. The only way is to disable all notification messages from Dropbox. To disable notification from Dropbox, follow the steps below. Type Settings and open it. On the left pane, select Notifications & actions. Scroll down until you see Dropbox from the list of apps under Get notifications from these senders. 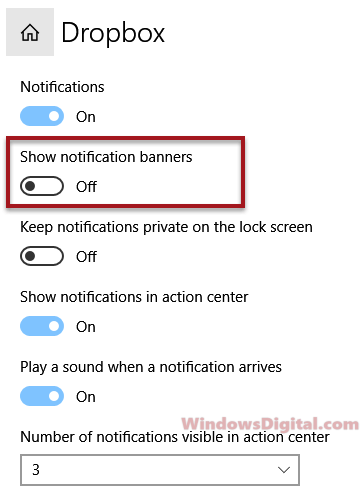 Click to toggle off the Notifications option. The Your Dropbox is almost full message and any future notification from Dropbox will no longer show up in the notification area or in the action center. 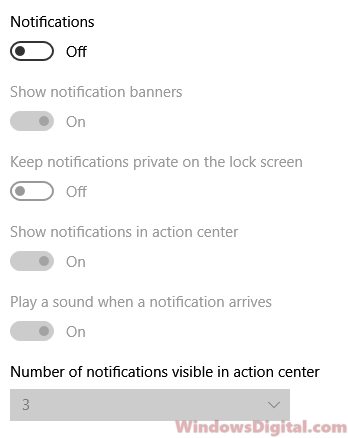 Alternatively, instead of turning off all notifications from Dropbox, you can disable only the notification banner but retain the notification in the action center. You can still access to the action center to check on the notification anytime you like. To do this, follow step 1 to 6 above. In the Dropbox notification setting, toggle off Show notification banners. Any future notification including Your Dropbox is almost full notification message from Dropbox will only appear in the action center and will no longer show up as a banner. Optionally, you can also disable the notification sound made by the “Your Dropbox is almost full” notification. Head back to the Dropbox notification setting and toggle off Play a sound when a notification arrives. 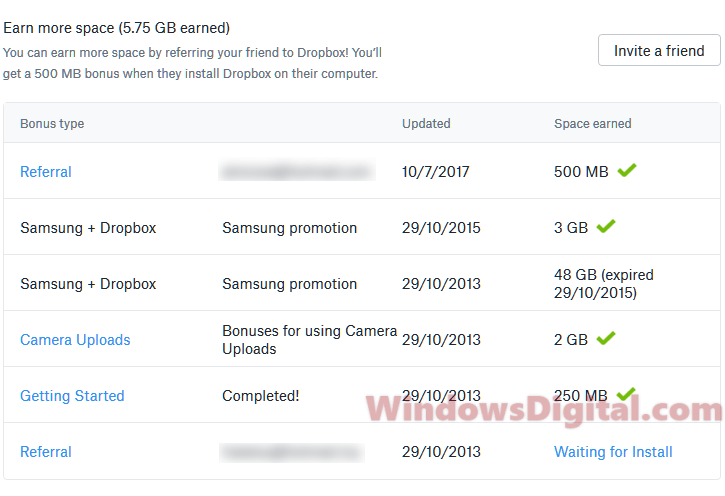 Well, if disabling Dropbox notification is out of the question, the best option is of course to upgrade your Dropbox account or earn more free space. Available Dropbox plans start from 1TB up to unlimited storage space (Dropbox basic, plus, professional, business and enterprise). Despite this, you can still earn more space for free by doing any of the following. Completing some steps in the Dropbox getting started guide. Use the camera uploads feature on your mobile phone for 2GB free space. Join promotion such as the Samsung Dropbox event or any other limited promotions for more free spaces. Description for sharing: Keep getting annoying popup from Dropbox? Here's how to turn off or disable "Your Dropbox is almost full" notification message in Windows 10.